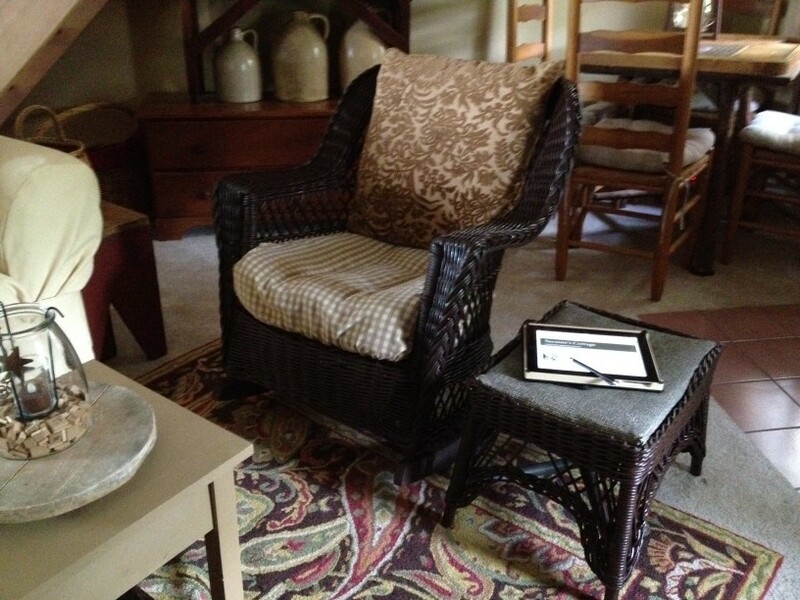 When I was at Brimfield a few weeks ago, I saw a wicker rocking chair that caught my eye. It was solid, but it needed some cosmetic work. They wanted $150 so I walked away, with my wallet intact. Last week I stopped by a yard sale and there was a nicer wicker rocker for $10! Yes, you read that correctly. I snatched it up and threw it in my car, thrilled about my bargain. When I got home I showed it to Charles and he offered to paint it for me if I went to Lowes to buy the paint. Remember the paint I mentioned in the Mountain Laurel post? I also had a wicker footstool I had picked up ages ago for $20. So with paint, old cushions and fabric that I had on hand, my wicker ensemble cost me less than $50! I’m excited.